Below is my “Big Day Out” column from the Saturday, April 21, 2012, Swansea edition of the South Wales Evening Post. WHAT TO TAKE? All the dinosaur models are outdoors, so don’t forget to bring a raincoat or umbrella with you. Tickets cost £13.75 for adults and £7.75 for children 16 and younger. Children under three years old go free and group discounts are available when there are 20 or more people visiting together. There are also a wide range of keepsakes available to buy in Rock & Dinosaur Shop. WHEN TO GO? Dan-yr-Ogof Showcaves will be open seven days a week now until Sunday 4 November 2012. The caves open at 10am, with tickets available throughout the day at the entrance until 3pm. TELL ME MORE: Dan-yr-Ogof Showcaves is approximately 25 minuets from the M4, taking junction 45 and following the brown tourist signs north on the A4067 (Pontardawe). For sat-nav users the postcode is SA9 1GJ. For more information about ticket prices phone 01639 730284 or got to www.showcaves.co.uk. 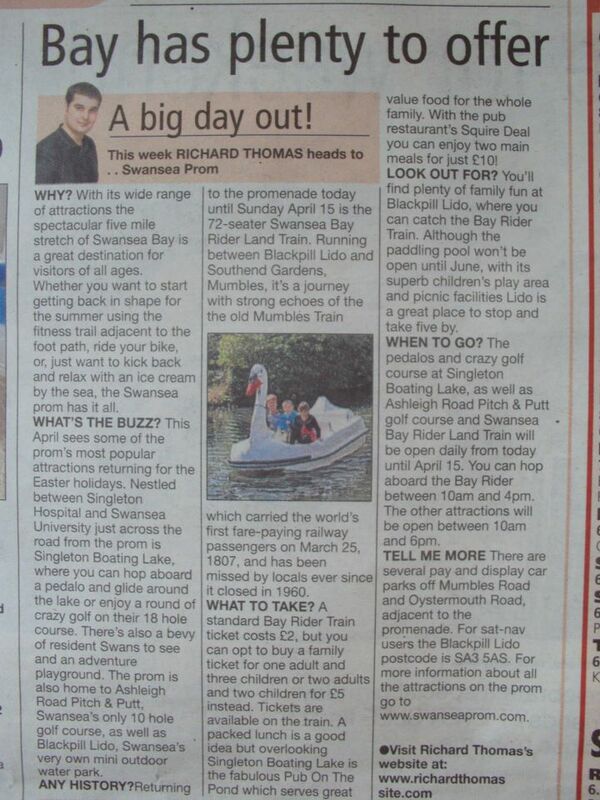 Below is my “Big Day Out” column from the Saturday, April 14, 2012, Swansea edition of the South Wales Evening Post. This week RICHARD THOMAS heads to the Swansea Spring Funfair to enjoy the rides and win some prizes. WHY? Today is the last day to catch the Spring Funfair at St Helens car park in Swansea. Whether you enjoy fast and furious rides or just want to test your skills on the stalls, there's lots to keep the whole family entertained for an afternoon. So don’t miss out on winning some giant bears and other special prizes! WHAT’S THE BUZZ? There's a wide variety of rides and games to choose from at the fair, with something to suit all ages. Younger children will enjoy the Jump And Smile Dome indoor bouncy castle, and for slightly older children there’s a Mini Coaster and Fun House. Parents and grand parents might prefer to try their luck on the stalls where you can win everything from toys of your favourite Walt Disney character to your own pet goldfish. For £2 you get a chance to win £10, all you have to do is knock all the tins off a shelf when you throw a ball. You get three tries but this is harder than it looks, a much more fun option is the air rifle stall game, where you shoot at different playing card targets to win a prize. There are also dodgems or bumper cars depending on whose doing the driving. LOOK OUT FOR? Thrill seekers won’t want to miss out on the Insomnia ride, where you get to find out what it’s like to get whirled around like you’re in a giant washing machine. ANY HISTORY? The first fairground rides began to appear in the 18th century. These early rides were small and made of wood and propelled by gangs of boys. In 1868, Frederick Savage, an agricultural engineer from Kings Lynn, devised a method of driving rides by steam. His invention, a steam engine mounted in the centre of the ride, transformed the fairground industry. WHAT TO TAKE? Chips, hotdogs, popcorn, candy floss and other treats are all for sale in the funfair’s food booths. Most rides cost £2 per person, with the exception of the dodgems which cost £3 per car. Stall game prices vary between £2 and £3. Hook A Duck costs £2.50 for each attempt but you're guaranteed to win a prize every time you play, making it the best option for younger players. Don't forget to bring some bags with you to take home all your prizes at the end of the day. WHEN TO GO? Today is the last day to enjoy the attractions at the funfair before it closes. The fair will be open today between 2pm and 10pm. TELL ME MORE: You can find the funfair in the car park adjacent to the St Helen's Rugby Ground. For sat nav users the address and postcode is: 1 Bryn Road, Brynmill, Swansea, SA2 0AR. Find out more at www.funfairwales.co.uk. 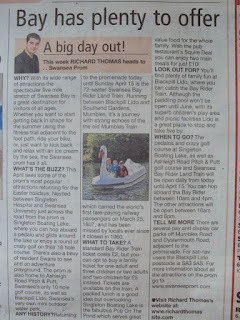 Below is my “Big Day Out” column from the Saturday, April 7, 2012, Swansea edition of the South Wales Evening Post. WHY? With the weather improving Joe’s Ice Cream Parlour in Mumbles is the best place to head to for an ice cream this Easter. Just across the road is the Tivoli Amusements Arcade where you can win a prize on the cranes and play on the slot machines. There are also other neat places to visit nearby like the fabulous 225 metre Mumbles Pier built in 1807, Mumbles Lighthouse completed in 1794 and Oystermouth Castle built in the 13th century. WHAT’S THE BUZZ? Joe’s Ice Cream has been famous for its unique blend of Italian ice cream and Welsh ingredients since it was first established in 1922. Although Joe’s do have different flavours, it’s the original vanilla ice cream that you want to go for, as there’s not another ice cream quite so rich and tasty. The inside of the Mumbles parlour is adorned with photos of the ice cream parlour’s founder, Joe Cascarini, and there is also plenty of space, making it the perfect option for large families or groups. To make this Easter extra special Joe’s are currently selling ice cream filled chocolates shaped like Easter eggs, bunnies and chicks available in all their most popular flavours, vanilla, mint and strawberry. Sold in boxes of 18 this is a great treat for Easter at just £4.95. LOOK OUT FOR? You can buy a cone or tub with nuts or chocolate bits for just £1.20. To find out more about the prices at Joe’s Ice Cream go to www.joes-icecream.co.uk. WHEN TO GO? Joes Ice Cream Parlour in Mumbles is open every Saturday between 9.30am and 6.30am. The parlour is also open on Sundays between 11am and 6pm and on weekdays between 9.30am to 5.30pm, except Mondays when they open at 10.30am. Below is my “Big Day Out” column from the Saturday, March 31, 2012, Swansea edition of the South Wales Evening Post. This week RICHARD THOMAS heads to Swansea Prom. WHY? With its wide range of attractions the spectacular five mile stretch of Swansea Bay is a great destination for visitors of all ages. Whether you want to start getting back in shape for the summer using the fitness trail adjacent to the foot path, ride your bike, or, just want to kick back and relax with an ice cream by the sea, the Swansea prom has it all. WHAT’S THE BUZZ? This April sees some of the prom's most popular attractions returning for the Easter holidays. Nestled between Singleton Hospital and Swansea University just across the road from the prom is Singleton Boating Lake, where you can hop aboard a pedalo and glide around the lake or enjoy a round of crazy golf on their 18 hole course. There's also a bevy of resident Swans to see and an adventure playground. The prom is also home to Ashleigh Road Pitch & Putt, Swansea's only 10 hole golf course, as well as Blackpill Lido, Swansea's very own mini outdoor water park. ANY HISTORY? Returning to the promenade today until Sunday April 15 is the 72 seater Swansea Bay Rider Land Train. Running between Blackpill Lido and Southend Gardens, Mumbles, it's a journey with strong echoes of the the old Mumbles Train which carried the world's first fare-paying railway passengers on March 25, 1807, and has been missed by locals ever since it closed in 1960. LOOK OUT FOR? You'll find plenty of family fun at Blackpill Lido, where you can catch the Bay Rider Train. Although the paddling pool won't be open until June, with its superb children's play area and picnic facilities Lido is a great place to stop and take five by. WHAT TO TAKE? A standard Bay Rider Train ticket costs £2, but you can opt to buy a family ticket for one adult and three children or two adults and two children for £5 instead. Tickets are available on the train. A packed lunch is a good idea but overlooking Singleton Boating Lake is the fabulous Pub On The Pond which serves great value food for the whole family. With the pub restaurant’s Squire Deal you can enjoy two main meals for just £10! WHEN TO GO? The pedalos and crazy golf course at Singleton Boating Lake, as well as Ashleigh Road Pitch & Putt golf course and Swansea Bay Rider Land Train will be open daily from today until April 15. You can hop aboard the Bay Rider between 10am and 4pm. The other attractions will be open between 10am and 6pm. TELL ME MORE: There are several pay and display car parks off Mumbles Road and Oystermouth Road, adjacent to the promenade. For-nav users the Blackpill Lido postcode is SA3 5AS. For more information about all the attractions on the prom go to www.swanseaprom.com.